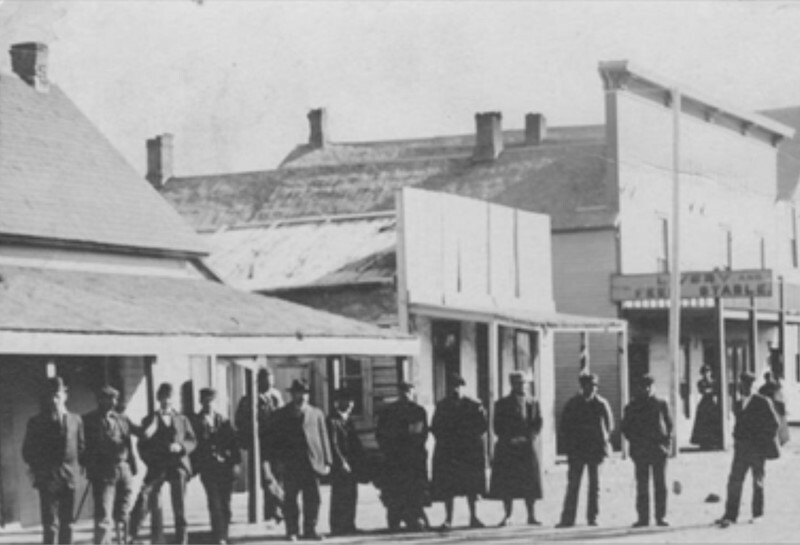 The tiny town of Utica, at the headwaters of the Judith River was established in 1880. Located approximately 40 miles from Lewistown it was headquarters for the Judith Basin roundups. It once thrived with around 800 residents. Nearby Yogo City which sprang up in 1879, brought around 1,000 miners to the area. Claims lined Yogo Creek, and tunnels burrowed into the hills to the north. Jake Hoover was elected to keep track of mining claims. But typical of boom and bust towns, most miners had moved on by 1881. Charlie Russell lived and worked with Hoover for two years, learning the way of the Indians, the mountain man, and the cowboy. Eventually, he moved to Utica where one of his first studios was in the corner of a saloon owned by Jim Shelton. Using house paint, Charlie created a large painting, Cowboy Camp During the Roundup, to hang over Shelton’s bar. During its short heyday, Utica was one of the wildest places in central Montana. It boosted four saloons which were popular with the local cowboys. Russell featured Utica’s main street in his famous A Quiet Day in Utica painting, which colorfully depicted bucking horses with cowboys. The painting included local businesswoman and former slave Mollie Ringold from Yogo City, as well as Jake Hoover and Russell himself. Two of Utica’s former establishments, the Silver Dollar Saloon and the Hotel Judith have been inducted into the Montana Cowboy Hall of Fame and Western Heritage Center. The Silver Dollar Saloon, built in 1888, was a large two-story building which included a bar downstairs and a dancehall upstairs called the Silver Slipper. The Hotel Judith was attached on one side and was an impressive two-story structure with fifteen rooms and a dining room. Calamity Jane for a time worked there as a cook. The popular destinations provided visitors everything they needed under two roofs. Utica has maintained and preserved key community buildings such as the early 20th Century school and community hall. The Utica Museum has a collection of artifacts from the Homestead Era, and has published two books on the history of Utica and the people who lived in the area. Local residents Don and Carol Waite are now recreating a scaled-down replica of the town as depicted in A Quiet Day in Utica.